Tip $25 and get A pre-order of the NEW MoB full-length album! EmmaC bought reward: "A pre-order of the NEW MoB full-length album! " Gail bought reward: "Download of "Faith & Fumes" EP + bonus Ty song "
blueredwagon: if it's possible to get the pedal bass drum a bit less prominent, that would help the mix. The Warming House: Love from Minnesota! gina-maynard: Gina C - hope you're feeling better! Susan & Rich: You out there? mwalsh73: What happened? We lost our feed! LindaBee: What about "Red Carpet"? Genevieve Barber: We're loving it! natherna: OH HELL YEAH GIRL! Love from Chicago, we miss you at Space Thanks for playing my fave! etaylorsalmon: Great show! Come back to Philly soon!! Susan & Rich tipped $10! Mouths of Babes - Live House Concert! Mouths of Babes - ALL REQUEST SHOW! I really appreciated the song Ty dedicated to those we lost in Orlando. I cried hard during that track. The show overall was really hopeful and upbeat though, and I was delighted to hear your music for the first time. Can't wait for the album now! These two have such incredible harmonies, and the joy they feel performing and the fun they have with one another and with their fans is infectious. I am very much hoping to see them live again sometime and appreciate having Concert Window as a way to enjoy their music in a live show format in the meantime. Thanks! The sound isn't the greatest, but that doesn't matter. Just thankful, i get to see, hear and feel your vibes again. Miss you guys on the West Coast. Thanks again. A pre-order of the NEW MoB full-length album! Mouths of Babes is Ty Greenstein (Girlyman) and Ingrid Elizabeth (Coyote Grace). Mouths of Babes burst onto the acoustic music scene in 2014 with big shoes to fill, and on their debut EP Faith & Fumes they delivered with songs that are equal parts celebration and blues, folk and soul, tear-jerker ballad and irreverent ditty. In just over a year, the duo has become a sought-after act in its own right, headlining some of the best rooms on the circuit, such as the Freight & Salvage in Berkeley, Evanston SPACE in Chicago, and Club Passim in Boston. Mouths of Babes is slated to go back into the studio in 2016 to record its highly anticipated first full-length CD. As a testament to MoB's fan power, the Kickstarter for the new album was wildly successful, drawing almost 800 backers and raising over $55,000 in 30 days. The key to the Mouths of Babes magic is in the contrast. Rarely is a sound or a show as balanced as it is with these two, and the differences in both their songwriting styles and personal presentation makes for an unusually satisfying yin and yang. The Chicago Tribune writes, “They offer unique counterpoints to one another…the laidback Ty, nattily dressed in a tie and crisp suit jacket, has a rich, lovely alto. Ingrid, clad in a sultry pink satin mini-dress, is a sassy chanteuse with a lilting soprano. 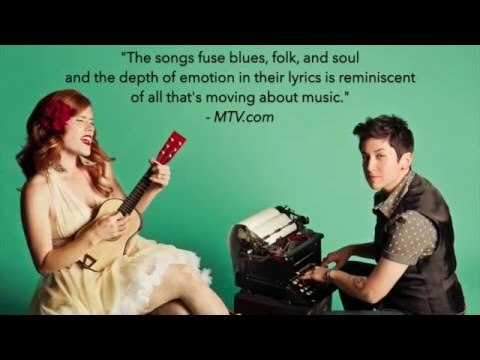 Trading jokes and sharing elegant harmonies, the two women display an intuitive professional bond.” They easily switch off lead vocals and play a wide array of instruments, with Ty on acoustic and electric guitars, banjo, and foot percussion, and Ingrid playing upright bass, ukulele, and cajon. Fans have quickly fallen in love with Mouths of Babes’ realness and humor as much as with their music. At live shows, audience members snort with laughter, cry into their date’s shoulder, and make confessions at the merch table. Ty and Ingrid are quick-witted, sincere, and accessible on social media, sharing photos of their daily life and posting videos of brand new songs recorded live from the dashboard of their Jetta TDI Sportwagen. They’re also dedicated activists, making a practice of donating 5% of their ticket sales to worthy social justice and environmental causes.